So after seeing Laura's fabulous flats of berries, I decided that I just had to get in on the raspberry action too! Mad Tom's raspberry season ends tomorrow so it was now or never. 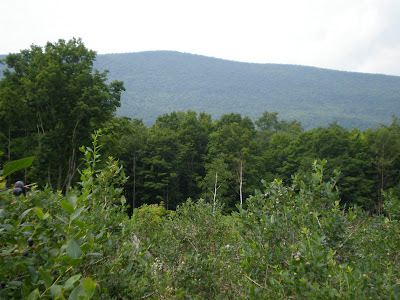 I told my dad that we needed to take a day-venture up to Vermont to pick a flat of berries. He rolled his eyes at me but agreed. So this morning instead of the usual weekday business, we hopped in the car and headed north. This is the farm property! Stunning!! Just absolutely cute beyond words. 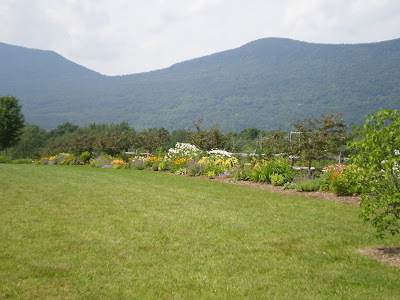 Oh how I LOVE Vermont! I think I ate a box-worth of berries while picking. Oh they are just heavenly! I was so surprised at the flavor difference between the red and black raspberries. I think the black berries are sweeter but they really do taste completely different. 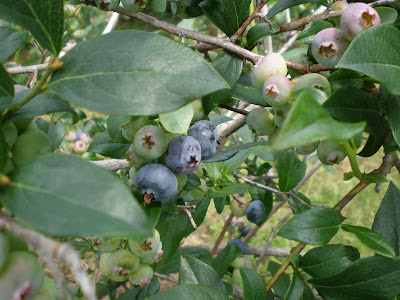 It was so nice just standing in the warm (and muggy, but seeing as how I get eight months of cold I am refraining from complaining) sunshine picking the sweetest fruit known to man. I was in heaven! 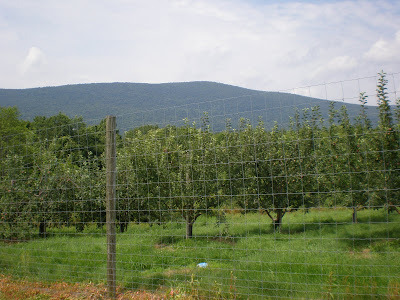 This is their apple orchard. You can bet your bottom dollar I will be back in the fall to pick a bushel and a peck of apples and check out the candy-colored view!! So after we filled a flat of combined red Nova and black (purplish) Royal raspberries, we decided we had to check out the blueberry farm just down the road. I mean, we were already there and everything. Oh this farm was just as cute as the first farm. And delicious! 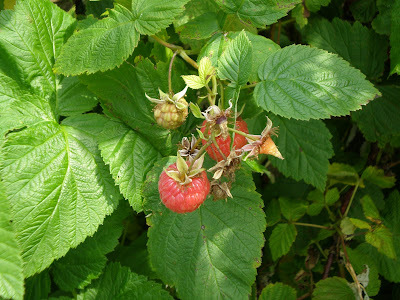 We had to walk all the way to the back of the field to find the big, ripe berries. So there I went along, pushing my way through blueberry bushes all while sporting a Lilly shift (I had my dad take a pic for your blog Miss Janice but he didn't get close enough so you can't really see the shift- not worth sending.) to fill my bucket with berries. I decided it would be a perfect family outing activity with kids of all ages. If berries are still in season near you, grab the kids and make a morning of it! You have to work for your berries and reach deep into the bushes sometimes. Singing for your supper makes you appreciate it that much more. Berry picking and scenic views really work up an appetite! So we went to lunch in my favorite town ever, Manchester, VT of course! I had a fabulous curry chicken salad sandwich, called "Yellow Submarine," and diet coke and was smiling from ear to ear and I "quickly ran into" the Lilly store while dad waited in the car with the berries and AC. Actually I was only in there for 15 minutes or so. I tried on three things, only one of which fit my chest (which is typical of Lilly. I love LOVE it but damn they need to make dresses to fit girls who are larger than a C cup please!! Actually, that's an in-general sentiment towards every single company making clothes today. But such is a topic for another time I suppose.). But it was HOT in there and even in my pink and green mecca, I am a very temperamental shopper if I am not feeling just right. I'm like Goldilocks of shopping. If I'm hungry, forgetaboutit. Thirsty, well y'all know about my constant need for liquids. Hot, oh I can't even carry on a reasonable conversation. No decisions could be made in such sweltering heat today. It was crowded too. Apparently the economy was just fine in Vermont today. Everywhere we went was packed to the gills with tourists. But if you are less high-maintenance when shopping, all Summer '09 is 50% off and all Fall '09 is 20% off. The fall stuff is so cute! Anyway, I was a good girl and left empty handed. Probably for the best. I'm not in the mood to buy anything for fall right now. It is still summer for an entire month and I plan on relishing every steamy moment of it! So on to my "problem" that I indicated in the post title. What the heck should I make with all of these berries? I don't have room to freeze many of them. Some, but not all. Or I could make some "stuff" and freeze some of that. But again, my freezer space is very limited at the moment. If I owned a second freezer I would have come home with three flats! So I am looking for recipes for blueberry-raspberry tarts. But what else? What do y'all love that uses blueberries and raspberries? Give me some fun ideas, please! Oh and while I enjoy making preserves, I will not be preserving any of these berries. Maybe if I had my own bushes and really needed to do something with them. But I honestly think that I can buy preserves that taste just as yummy at the farmer's market. And I don't really eat preserves/jams/jellies very often so its just not something I feel a need to make this week. 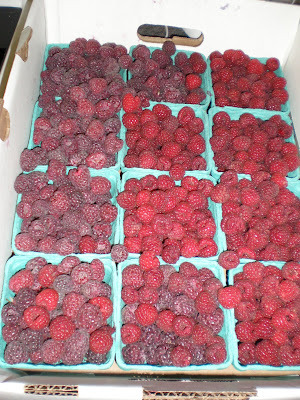 Oh, would you like to know what one pays for this many raspberries and blueberries at a u-pick place in Vermont? 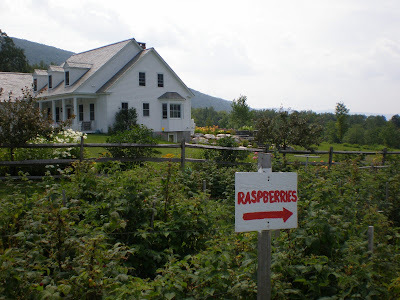 The flat of raspberries was $18. 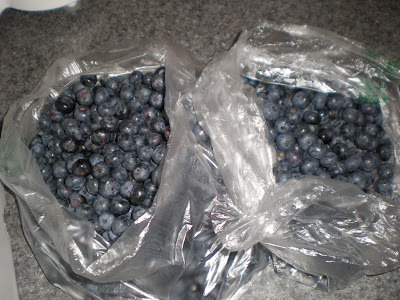 And nearly four pounds of blueberries was a whopping $7.50. Now of course I had to drive nearly 1.5 hours to get there but it was so worth it. They are tender and sweet and just divine! Today was just such a fabulous day with my daddy!! We totally lucked out weather-wise too! It was sunny and gorgeous all day until we were driving out of town when the skies opened up. Perfect timing! But seriously, what should I bake/make/do with all of my berries, y'all?! I've made it a bunch of times and it's ridiculous how easy and GOOD it is! Yall are killing me here! I live for berries! I wish we had a berry farm other than strawberries) near us. I literally - literally - eat berries every day. I went into the healthcare industry, but one day - I'm gonna open a berry stand/farm. It's destiny! This sounds like a wonderful adventure! It sounds like you and your dad had a great time together. Those berries look so delicious! How about blueberry pancakes, blueberry/raspberry muffins, all kinds of pies and tarts? You could also eat them on salads and on yogurt. Yum! Sounds like a great day! I like to put fresh berries on top of brownie ala modes. Anoter idea could be just to make a few pies and bring them to neighbors/co-workers, anyone really just for the fun of it! I think berry cobblers are delicious. And smoothie too! I make mine with some Silk milk because its vanilla ffavored and creamier. muffins, pancakes, bring them in lunch like you would an apple, just pack more carefully, desserts, yum!!! 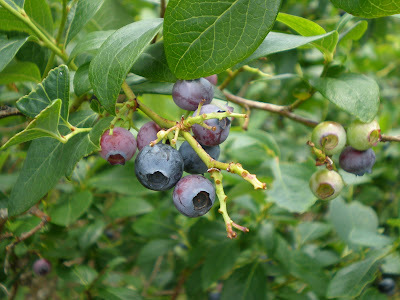 i just read that blueberries speed up metabolism, too...bonus! Oh, I'm so happy you went to Mad Tom Orchard!!! I'm going to have to get to the blueberry place next week. So for freezing the berries, you just wash them, lay them out on a sheet pan and freeze. Then you can scoop them into bags for use as smoothies, pies or cobblers. I'm going to post some recipes tomorrow so you can check my blog for some links and possibly some actual recipes. 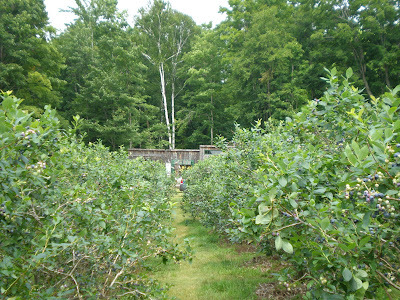 We'll have to make a date to pick apples at Mad Tom in the Fall!!! PS did you get to drive by the equestrian show?? Anyone Want A Free Dress?